Strangely, I moved to another blogsite mid-season. Close to 4th of July, I got my own domain and declared independence from Blogger. I then came out strongly against memes (especially the Internet party talk variety) and wrote some posts about Japanese food. I’ve played around with the blog’s appearance a few times, but I keep coming back to the Prismacolor theme. Project Runway, Pride, and Comic-Com should provide me no shortage of posts. I don’t doubt I’ll find some other material in the meantime. I’ve also wanted to revive the podcast, but more or less start again. I’ve created the page, but I haven’t posted any materials. 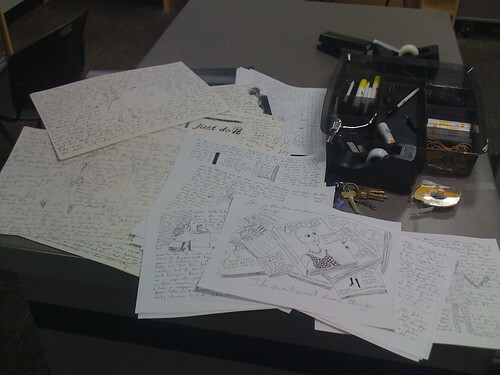 I plan to create personal audio logs, vlogs like I did last fall, and readings of creative works. I’ll set a date in August as I want to get it right and keep going. One work I’ve wanted to feature for a long time here is Resplendence. I’ve tried creating a website a few times, but I think I should be able to render it the way I want to here. I’ll also set it for August as I’m working on getting text ready for the posts. I also want to get reproductions of the images going. My goal for the post-Blogger incarnation of ShindoTV is to generate and create a body of content. I definitely want it to be the kind of place where I’d come back to check out. I think I’m doing well to avoid the obvious memes (what I call the “party questions”), but it helps to try to write a post instead of letting something else speak for you. Also, I think I won’t resort to anything to get notice. No more breaking news on Chris Crocker’s lawsuit or all the other trivialities of pop culture (not that it’s fun, but it’s all about me here). Some of these types of post have generated lots of hits, but I’m not really proud of them at all. I do stand by some other things that aren’t as popular hit-wise, but are much more interesting. Oh, I do owe some thanks to Chris for getting me out of hiding and start posting again. Blog death could have happnend. Friends, I apologize for the whole comment moderation thing. Being new to WordPress, I think I more or less got the hang of the system, but not quite. The default setting for comments seems to be “under moderation.” It’s frustrating because I don’t want to have to keep approving comments for people such as Chris, Brian, Fredo, and a couple of others. It’s too time consuming and there are times where I am not at my computer for hours at a time. Also, I don’t have a history of getting hit with nasty comments. Whenever I get a comment from an offensive person, I can delete it. This morning, I had a strange situation created by the Akismet plug-in. I enabled it a few days ago, thinking that I have spam protection. I have been spammed in the past, most notably by somone who posted in Portuguese last year. No strangers got caught in the Askimet spam net, but Brian did. It was frustrating that a fun and clever comment of his was held up for a few hours. I’ve been adjusting the settings here and there, but nothing seems to make the comment moderation go away. Please be patient with me and any tips are appreciated. It’s official. I’m not posting to the Blogger blog anymore, nor will I create mirror posts. This is ShindoTV’s home now. I’ve more or less gotten the hang of WordPress, but I haven’t mastered the templates yet. I’d love to find one that mirrors the aesthetic of the screenshot below. 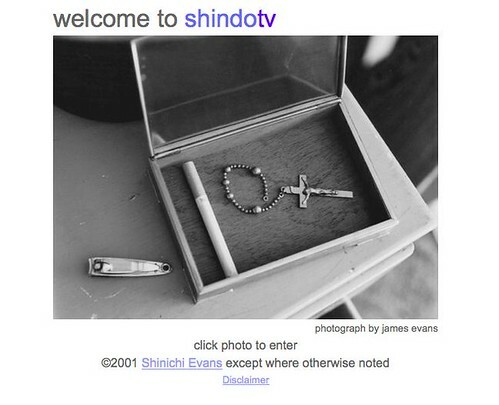 It was pre-blog ShindoTV – oh, what a simpler time that was! I did have some good times on Blogger. I made some friends and got some subscribers. I even got to meet some of them in person over the past year. 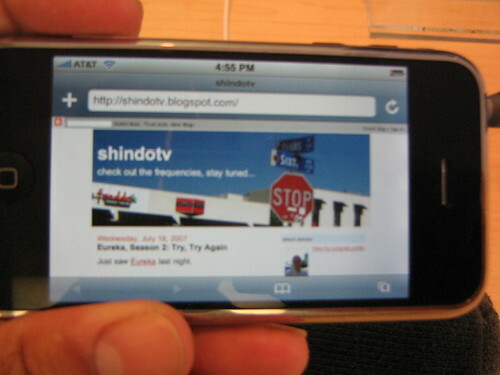 The blog came of age in the Age of iPhone. While I don’t own one of these dandy devices, it was fun to take a picture of my blog. Eventually, this one will look good in a mobile format. Being part of a blogging community has been meaningful. Being part of an online conversation has been very good for ShindoTV. I also hope to find new readers and friends along the way to help contribute to the discussion. Here is to whatever interesting developments will come for ShindoTV! Goodbye, old blog!